Another great way to get healthier and reduce your risk of disease is riding a bike! 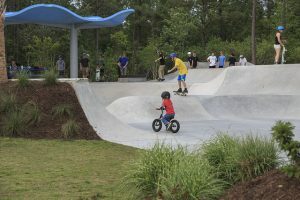 Blue Clay Bike Park is located in Northern New Hanover County and has approximately 8 miles of trails. 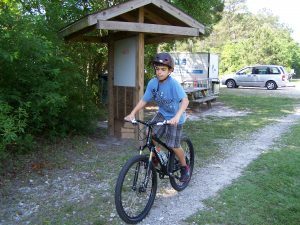 It is the most extensive bike trail in New Hanover County and is suitable for all levels of cyclist from beginner to advanced. Geocaching is a real-world treasure hunting game that uses handheld GPS-enabled devices to find geocaches (containers) hidden in different locations. There are currently over 50 geocaches hidden in our county parks. Geocaching is great way to explore your county parks while getting some exercise, too! The 10,000 square foot concrete park has a skate bowl and street features such as rails and steps. The skatepark is open daily from 8am-sunset and is appropriate for skateboards and BMX freestyle bikes. Don’t forget your helmets, knee and elbow pads!